Less than a week after the Samsung Galaxy Note5 started receiving its first software update, the Galaxy S6 edge+ - which was made official alongside the former back in August this year - has also started getting its debut update. 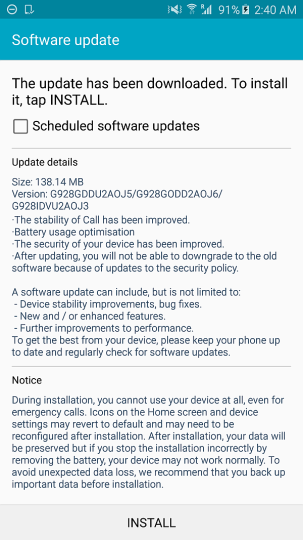 Weighing in at 138.14 MB and carrying a build number of G928GDDU2AOJ5, the update brings call stability, battery optimizations, as well as improvements related to the security of the device. Also, you won't be able to downgrade after the update. If you compare, this looks like the same update that the Galaxy Note5 received last week. Anyway, the update is reportedly currently rolling out in Europe and India, with other regions likely to follow soon.